LiveArt Jewelry Designer Solutions lets your users design their very own hand-crafted jewelry design and send it to production. 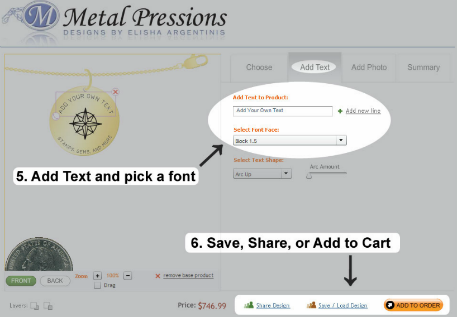 Open online jewelry shop with your ideas with our turn-key platform, developed in partnership with MetalPressions.com. Robust, easy to work with and fully online, it allows customers make design from desktop PC, tablet or mobile. LiveArt have been working with MetalPressions during three years developing the most up to date innovative online jewelry designer tool. The software offers customers the unprecedented flexibility to pick elements and apply hand-stamped text. The design software has been integrated into a world class AbleCommerce shopping cart platform to give customers a seamless shopping experience unlike anything else out there. Personalized jewelry - what better way to mark a special occasion or make an eternal memory! Imagine precious words on an everlasting charm accompanied by a symbol of love, beautifully put together in a jewelry design meant exclusively for someone.